Roadworks staff have told The Lincolnite that they have been subjected to abuse from fuming Lincoln motorists on the first day of six-month city centre road closures. “In just one day, I’ve been called a t**t and a w****r”, said one staff member who wished to remain anonymous, who also explained that motorists were trying to bypass the road closures. Lincolnshire County Council has reminded motorists driving in Lincoln to observe the lane closures in place as part of the East-West Link Road project. 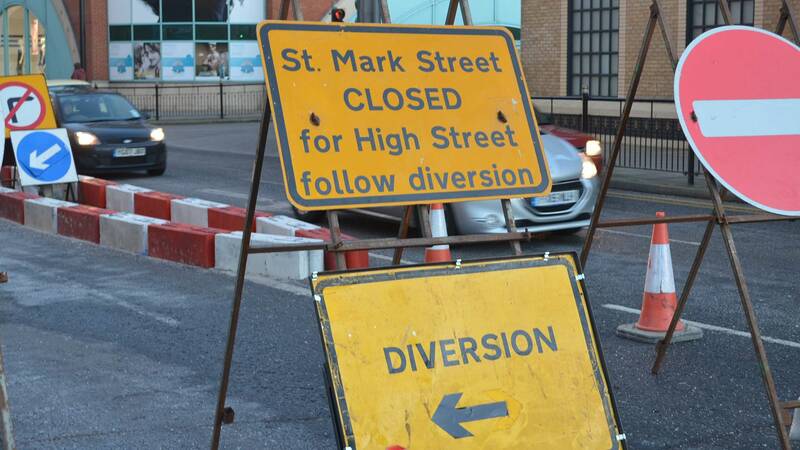 St Mark Street eastbound will be closed to traffic until the end of August while High Street northbound between St Mark Street and Wigford Way remains closed. There is also an overnight closure on High Street for up to six weeks. Executive Member for Highways and Transportation, Councillor Richard Davies, said: “We only close roads when we really have to. “Sometimes there may be a temptation for motorists to ignore a lane closure, but it is important for their own safety and for that of other motorists and those carrying out the work, that they adhere to all traffic management. Diversions are in place for all lane or road closures to ensure that motorists can easily reach their destination, but they are advised to leave extra time for their journey as at busy times delays can occur. As previously reported, work on the city’s East West Link entered a new phase in January, with a new road bridge installed off Tentercroft Street. Cars are expected to be able to use the new road from September 2016.